I really hope this kit will be helpful for anyone who wants to start their macrame journey. I have put together a new kumihimo starter kit that would be perfect for beginning your kumihimo journey or to give away as a present. It contains everything you will need to practice making your first kumihimo bracelets or necklaces with both cord and beads, and also includes instructions for a basic kumihimo braid with cord and a basic beaded kumihimo braid. I have posted a new picture tutorial on my website. It is for my rosebud macrame bracelet design that I already have a video tutorial on, but I was requested to make a picture tutorial and here it is. Hopefully this will be helpful to go alongside my video tutorial of the bracelet which can be found here. This week I am going to talk about some plans I have for both my Youtube channel and my website for the near future and upcoming things, and I would love to get some feedback on them. I am going to start out with some plans I have for my Youtube channel. I am planning on making a series of short videos with wire weaves, where I show how to do a specific wire weave in each video and it will be an ongoing series that I will be posting videos to every now and then in between my regular tutorials. I have also been thinking of another video series that I have been wanting to do for a while. Music is and always has been a very big part of my life, but it isn’t something I have brought into my jewellery making very much. So that is something I have really been wanting to do. To make different designs within different mediums that are music related. I already have a few ideas, but I would love to get some feedback on the interest for tutorials like this and also any suggestions or requests for design ideas that you might have. The next thing I want to talk about is my website. I have recently been expanding the features on my website by adding some free tutorials in picture and written form. So far I have focused on kumihimo tutorials, but I am planning to also start adding tutorials for macrame and wirework to my website. I plan on starting this within the next month or two and continue to add new tutorials over time. I am also planning on creating more kits that will be available for purchase like my current ‘Rainbow beaded kumihimo kit’, and this will also be within different mediums. Among these I am planning on making a kumihimo starter kit that will include all the things you will need to get started with kumihimo and beaded kumihimo and that will also be ready within the next month or two. I hope that you are as excited about these plans and ideas as me, and I can’t wait to bring them to you. And please feel free to give me some feedback on the ideas and let me know if you have any suggestions or requests for music related designs. This week I want to share my favourite jewellery making situation with you, and would also love to hear yours. It doesn’t often come around for me to enjoy (in fact only once a year), but I got to enjoy the experience this week. 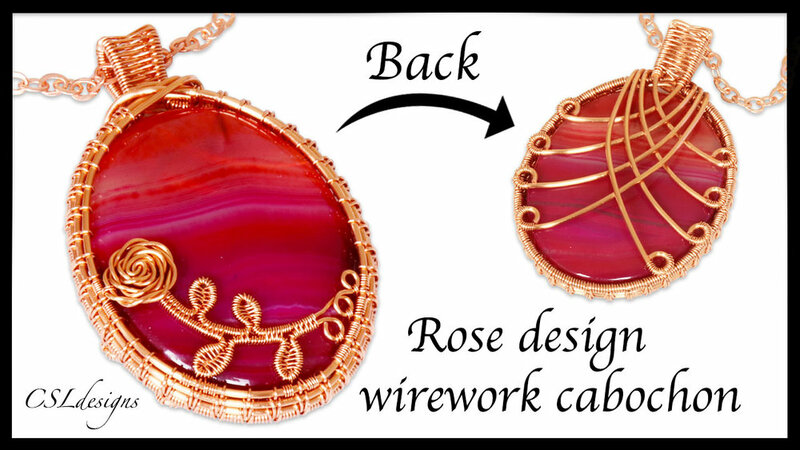 So I think about what medium of jewellery making I feel like ‘playing’ with and that day decided on working on a wirework design I have been wanting to do for a while now, and then I get all the materials and tools ready so I don’t have to interrupt to much during, if I can avoid it. I then turn on the tv, set it to the right channel, and wait for the programme to start. And finally, after a whole year, the final of the Snooker world championship starts, and I’ve got hours of exciting snooker to look forward to. I enjoy watching snooker whenever it’s on, but there is something special about the final in the world championship. And I knew I had hours of snooker and jewellery making in front of me to enjoy, as the final stretches over two day. And I certainly enjoyed both the snooker and the jewellery making, the only downside is that now there is a full year until it comes around again, but until then I will just have to ‘settle’ for some of my second favourite jewellery making situations. So that is my ideal jewellery making situation, and I would love to know what yours is. We are fast approaching the month of May (the fifth month of the year, wow), and spring has most certainly sprung in my neck of the woods. The days are filled with sunshine, the temperatures are rising and one bloom after another is showing its beauty. It feels like only a few weeks ago it was after the big Christmas rush, but it’s happened again like every year, that we’re almost halfway through the year, just recovering from the last and can already start thinking about the end of the year again. Sometimes it is nice as there are things we look forward to, and the sooner they arrive the better, but other times it can be a little scary as it can be hard to keep up, but we can only do our best and try and enjoy every part that we can. I personally find spring to be a very beautiful, motivational and inspiring time, especially coming from winter. Nature just seems to be exploding in bloom and life and that is one of the most inspiring things for me and my jewellery making. I find much of my inspiration from nature, in both flowers, animals and plants and find myself to be generally much happier as the sun comes out. This is also maybe the time where some of us think more about the plans for the rest of the year as we have newly recharged energy after the rush and darkness of winter, which in turn can be a little frustrating as it is hard to know what to do with all these thoughts and ideas. This is where you wish there were more hours in the day and we didn’t have to sleep so we could do it all at once, but unfortunately that isn’t the case, so we just have to deal with the time we are given in the best possible way. I for one am trying to stay on the positive side of things, and avoid the stress factors that this brings with it, and I’m looking forward to bringing you many more designs and updates throughout the year. I was recently contacted by Jewellery Maker, which is an online jewellery making supply shop, that I myself shop with frequently. They have recently started selling ready made kits for specific pieces of jewellery and were kind enough to send me one to try out, and I chose the star charm bracelet in rose gold. It is a single length of chain where you then get all your star charms and jump rings you need to attach them, and you also get the clasp to finish off the bracelet. So you can make a full bracelet from just this kit using only a few basic pliers, and all you need to know is how to open and close a jump ring. The kit also includes the directions that you need for the piece of jewellery. These kits are a great and easy way to create a piece of jewellery that you really like where you don’t have to get all the materials yourself as everything is included in the kit. And it would also be a great gift idea. Once you have then added your beads into your braid until you have reached your desired length, you then continue your braid without beads to repeat the small section of braid like you did in the beginning. You have now finished your beaded kumihimo Christmas wreath bracelet, and it should look something like this. A perfect design for a piece of Christmas jewellery. So finally this week is coming around. It has been in the planning for over a year and has all of a sudden snuck up on us. I am going home to see my family for a month for the first time in almost a year and it is the first time in five years that I get to be with my family for a full month, so I have been waiting, anticipating and looking forward to this ever since we started planning it over a year ago, as it obviously takes a lot of planning because we are going for so long. So for the past couple of months we have been slowly preparing, and for the last couple of weeks it has been a race to get everything done and ready to go. So now we are getting so close, the last few days will be spent finishing all the work I need to do and then get things ready for travelling. One of the challenges will be the packing, because hopefully my mum and I will be doing some craft markets while I am at home, so I need to bring all my finished jewellery that I have for sale, and therein lies the challenge. To pack things so they are safe during the travelling as they don’t exactly handle the suitcases that gently. So hopefully I will figure out how to do that best and maybe I’ll be able to share my experience in the future with you, that might be useful. But once that is all sorted I can’t wait to get home and see my family and spend time with them all, and spend loads of time being creative with my mum, as that is something we both love to do together, and there are many thoughts and ideas I have for us to make. And it will be lovely helping each other out with anything and just actually be able to sit together while we make things, in stead of just sending each other pictures when we have made something new, like we do normally. So this month will hopefully be a lovely boost and regenerator for us all so we can then come back to our everyday lives afterwards with new energy and hold us off for the next time we can see each other again.